Researchers propose an ammonia-water slurry as the basis for Pluto's newly discovered geologic activity and possible volcanism, and offer a new method to predict planetary vigor. The findings were presented at the annual meeting of the Division for Planetary Sciences of the American Astronomical Society on Monday (Nov. 9) in National Harbor, Maryland. Graduate student Alex Trowbridge, under the guidance of Jay Melosh, a distinguished professor of earth, atmospheric and planetary sciences, and professor of physics and aerospace engineering, performed the research in response to data reported by NASA's New Horizons mission to the Pluto system and the Kuiper Belt that revealed a surprising amount of geologic activity on the dwarf planet's surface. "We wanted to know why this small, icy cold dwarf planet is so active and to find a way to predict such activity for planets and other planetary bodies for which we have little information," Melosh said. "The New Horizons mission has already provided an astounding amount of new information, and its surprises remind us how little we know about the far reaches of our solar system and the depths of outer space beyond it. This is why these missions are so important." A geologically active surface that buries craters and raises mountains means the mantle that lies below is moving. The mantle is the layer between the crust and core of a planet or planetary body. In the Earth's mantle a very slow convection occurs in which hot material rises up and cooler material sinks. This movement occurs over millions of years and is responsible for the movement of the tectonic plates. Mantle convection also leads to geologic activity that rejuvenates the surface, erasing impact craters and bringing fresh material to the surface. Images of the surface of Pluto show young surfaces that indicate it is geologically active. Mantle convection is like a pot of oatmeal on a hot stove, Melosh said. If the heat is too low, it just sits there, but, if the heat is turned up, it starts overturning and hot oatmeal is pushed to the top. "We expect a piping hot pot of oatmeal to roil and churn, but we don't expect a block of ice to have much movement," he said. "It had been thought that pure water ice sat below the surface of Pluto, which has an average temperature of more than 300 degrees below zero, but there is evidence that suggests the presence of ammonia. That little bit of antifreeze makes all the difference." Trowbridge, Melosh and Andy Freed, a Purdue professor of earth, atmospheric and planetary sciences, used a convection model to analyze the possibility for geologic activity with a mantle of pure water ice and one that was 5 percent ammonia. The team used the model to deduce the Rayleigh number, a mathematical term associated with the level of buoyancy-driven flow, or convection. "We found that a mantle containing a small amount of ammonia - which has been seen on the surface of bodies in the outer solar system and plausibly condensed in the planets in this region – lowers the temperature required to achieve a Rayleigh number where convection occurs," Trowbridge said. "The ammonia lowers the viscosity of water ice by a factor of 100,000. 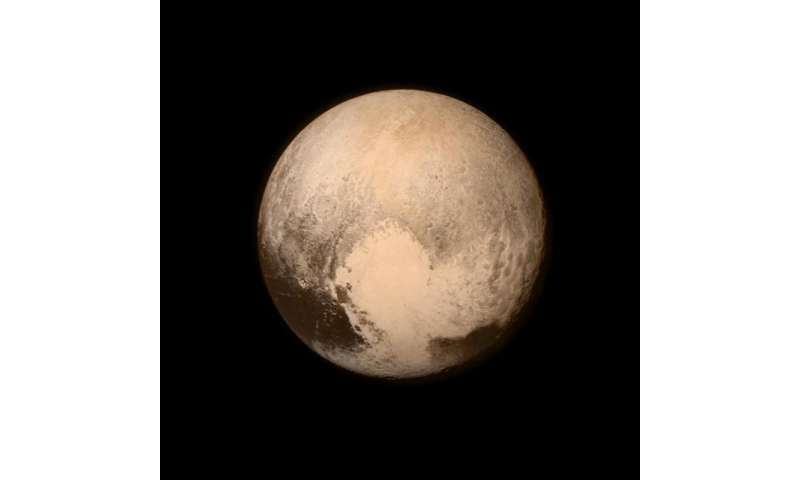 This would allow for the geologically active and vigorous Pluto seen in the New Horizon images." The team also created a new model to predict mantle convection and, in turn, whether a planet or object is geologically active. Previously the set of equations used to compute convective vigor required knowledge of the average temperature of the mantle, which is not known for many planets and planetary bodies, including Pluto, Trowbridge said. The team added the understanding of heat transport into the mix, and crafted an equation which, when added into the standard system of equations, gave the ability to solve for convective vigor when all that is known is size, heat generation and the mantle material, Melosh said. "It is a complicated and interdependent set of mathematical equations, as often is the case, but convective vigor and heat transport have been known to be entwined for some time," Melosh said. "In hindsight it is a solution that was hiding in plain sight all along. We hope that we now have a universal model for planetary vigor that can be applied to planets, satellites and other bodies where such a prediction was previously impossible." The team plans to continue to test the model and apply it to other planetary bodies encountered on the New Horizons mission. Abstracts submitted to the organizing committee of the meeting of the Division for Planetary Sciences of American Astronomical Society do not go through a peer review process. The team next plans to submit a paper detailing the research for publication in a peer-reviewed journal. Against many expectations, New Horizons' images of the surface of Pluto and Charon show seemingly young surfaces. On Pluto, images of an equatorial region south of the Tombaugh Regio reveal a mountain range with peaks jutting as high as 3,500 meters. The low concentration of craters for these mountains suggests an age of 100 million years, indicating that Pluto is geologically active. Other evidence for geologic activity includes a fault cross-cutting ridges, smooth lightly cratered plains with flow fronts, and a pair of apparent stratovolcanoes. Charon similarly possesses very few craters and a spectacular system of troughs. Both observations suggest the possible presence of active cryogeysers and cryovolcanoes. The underlying cause of modern tectonic and volcanic activity on any object is likely a vigorous mantle convection regime. We are thus led to consider what determines planetary vigor. While Pluto and Charon seem to be quite active, Ceres and the much larger Callisto seem to lack modern endogenic activity, even though all of these bodies are likely to possess water ice mantles. We coupled a parameterized convection model with a temperature dependent rheology for pure water ice, deducing a barely critical Rayleigh number of ~1600 for Pluto's mantle and <1000 for Charon, suggesting that a water ice mantle alone may be insufficient to support vigorous convection in these bodies. However, in the outer solar system, other volatiles may have condensed. Ammonium hydrate has been reported on the surface of Charon. At temperatures above the eutectic (176 K), Durham et al. (1993) showed that NH3 lowers the viscosity of water ice by 4 orders of magnitude. Our model indicates that, with NH3, the mean temperature of the mantle of Pluto is at the eutectic and its Ra ~ 10^4. The presence of NH3 dramatically increases the vigor of convection for the two bodies and suggests that ammonia-water slurries are the basis for Pluto's volcanism. We propose that the presence or absence of active mantle convection may offer a universal criterion for endogenic planetary vigor.